-Battle the Corrupted Soltar in the Fortress of Souls and confront his evil corrosive magic! -Enter a retro 16-bit RPG and traverse the lands to save the Goddesses! -Enjoy a fast-paced puzzle combat! Match your heroes’ skill blocks to quickly decimate your enemies, and deliver devastating special moves! 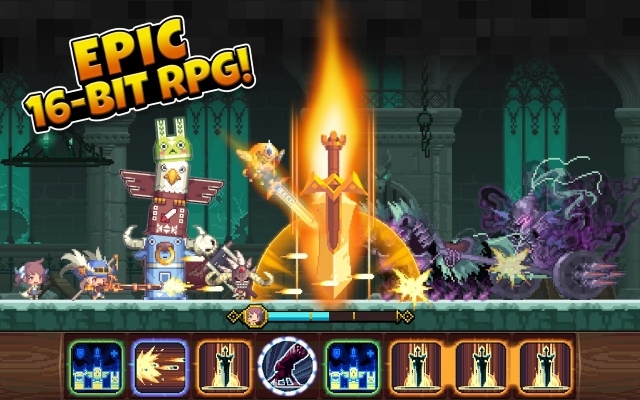 -Strengthen your Heroes and enter the Colosseum and battle against the might from around the world! With over 200 Heroes to collect, the combinations are endless! Does your team have what it takes to get to the top? -Uncover the mystery of the madness in the world. Follow the trail of magic rescue the Goddesses, on their quest to cleanse the corruption from the world! -Gear up 6 Unique Classes, with over 200 Unique Heroes in this 16-bit world! Choose the Powerful Warrior, the Magical Wizard, the Precise Hunter, the Lightning Quick Archer, the Priest with the Healing Grace, or the Paladin, who strikes with Holy Might!